Kempner Cougars embrace, cultivate and innovate. The highly trained faculty fosters an environment that is conducive to learning, maintains high academic standards and provides opportunities for success. 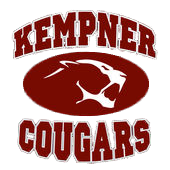 In addition to a strong curriculum, Kempner offers a wide range of extracurricular offerings in athletics and the arts, as well as 22 clubs and nine honor societies. Over the years, Kempner organizations have won a slew of awards including, most recently, top honors for its speech and debate team and the Air Force JROTC Unit. The school boasts a 95 percent graduation rate.